You may start this tour at the cruise ship pier or at the lobby of your hotel. Dive into Acapulco's historical heritage, learn from you knowledgeable guide all there is to know about the Fort of San Diego Museum, the Municipal Market of Acapulco, the Cathedral of the City and the Diego Rivera's Mural, watch the amazing cliff divers show and finally make a visit to the famous Los Flamingos Hotel, the Hollywood Gang Hideaway. You will then have time enough to have lunch (not included) in a charming and reasonable restaurant on the beach. Head first to the Municipal Market of Acapulco for a visit. The place where the locals get their groceries, fruits and vegetables, chicken, meat and fish. You will then enjoy a guided visit at the Fort of San Diego, built in 1616 by the Spaniards to protect the port from pirates. 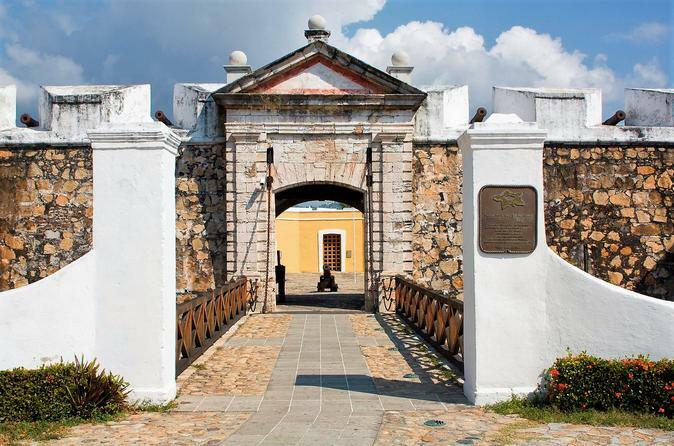 It's the most important maritime fortress on the Pacific and part of several garrisons built by the Spanish Crown to protect their possessions in the New Spain from the attack of pirates. The museum exhibits Acapulco's History and the cultural interchange with east as well. Afterwards you will be shown the Main Square and the Cathedral heading towards Diego Rivera’s Mural, created by the Mexican artist on the Front Facade of Casa de los Vientos, owned by the famous art collector and Diego's muse: Dolores Olmedo a beautiful Mural dedicated to Quetzalcoatl, the most important God of the Aztecs. Enjoy a knowledgeable explanation of the Mural and then continue to La Quebrada to enjoy the cliff Divers Show at La Quebrada, the impressive cliff with 112 ft of height is where brave natives perform a diving spectacle. The real challenge is finding the exact moment to jump. The admission is included. Finally your tour will head to "Los Flamingos" Hotel the home of the Hollywood Gang and the home were Johnny Weismuller spent the last years of his life a place with the nicest view to the Pacific from Acapulco. At last go to "La Cabaña Restaurant" for lunch or only drinks (not included) and head back to the hotel afterwards... End of our services.